Plagiarism is when an author attempts to pass off someone else's work as his or her own. Duplicate publication, sometimes called self-plagiarism, occurs when an author reuses substantial parts of his or her own published work without providing the appropriate references. This can range from getting an identical paper published in multiple journals, to “salami-slicing,” where authors add small amounts of new data to a previous paper. Plagiarism can be said to have clearly occurred when large chunks of text have been cut-and-pasted. 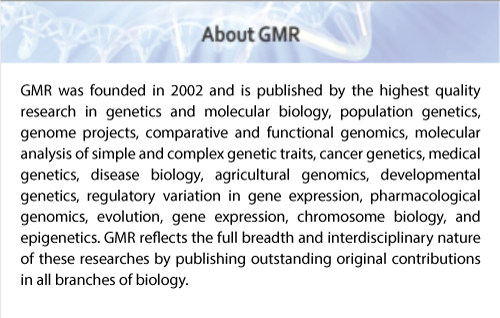 Such manuscripts would not be considered for publication in Genetics and Molecular Research (GMR). However, minor plagiarism without dishonest intent is relatively common, for example, when an author reuses parts of an introduction from an earlier paper. The journal editors judge any case of which they become aware (either by their own knowledge of and reading about the literature, or when alerted by referees) on its own merits. Genetics and Molecular Research uses PlagScan, an initiative to help editors verify the originality of submitted manuscripts. As part of this process, the selected manuscripts are scanned and compared with the papers available in database indexes. Should a case of plagiarism come to light after a paper is published in GMR, the journal will conduct a preliminary investigation. If the paper is found to be plagiarized, the journal will contact the author's institute and funding agencies. A determination of misconduct will lead to GMR running a statement, bidirectionally linked online to and from the original paper, to note the plagiarism and to provide a reference to the plagiarized material. The paper containing the plagiarism will also be clearly marked on each page of the PDF. Depending on the extent of plagiarism, the paper may also be formally retracted. Manuscripts are sent out for review on the condition that any unpublished data cited within are properly credited, and the appropriate permission has been sought. Where licensed data are cited, authors must include during submission a written assurance that they are complying with the originators' data-licensing agreements. Referees are encouraged to be alert to the use of appropriated unpublished data from databases or from any other source, and to inform the editor of any concerns they may have.